This website is mainly here as a virtual art gallery of the woodturning items I have made and as a a point-of-contact for those wishing to inquire about my work. I have been a part-time woodturner since 1998 and hope to continue it for quite some time into the future. 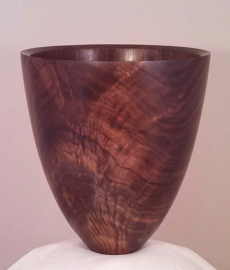 Woodturning is a form of wood-working that has become quite popular over the past couple decades - particularly due to a strong community of artists and craftsman who have formed various non-profit clubs and organizations. While woodturning, and many of forms of woodworking, started from a predominantly utilitarian perspective, the beauty of natural wood and clean form helped to evolve it into a true art form. Better yet, through that same artistic eye, it continues along both paths of pure and utilitarian art. While you don't find many woodturners churning out a set of crude plates for the family to use at dinner tonight, you might find an accomplished 'turner' who will hand-craft a perfect set of wood or mixed-material plates or bowls for just that perfect occasion. On a more practical level, many of us enjoy making a fine, artistic pen or other gift that you can use regularly. I hope you enjoy the images and descriptions of the bowls, hollow forms, ornaments, pens, and other items I turn from time to time. Woodturning is first a hobby for me. It is a hobby I love in which I can express creativity while producing something used by others for art, decoration, or day-to-day function. Do I sell my works? From time to time, yes. I do this mainly to support the hobby. I do not, however, see it as a 'job'. If you are interested in a custom-made item, let me know and we can talk over what you need and when I can begin a production run.